I’ve just returned from KBIS 2019 (the Kitchen & Bath Industry Show), where there was plenty of eye candy and a plethora of beautiful products for the home. Kohler and Brizo were style standouts in bath fixtures. Integrated sink accessories that make prep and clean up a wiz is a mainstreaming trend for the kitchen. Internal cabinet accessories, special acting hinges & hardware along with matte door finishes round out what’s hot in kitchen design. Smart homes with voice activated technology continue to advance on every platform; like science fiction morphing into reality. Alexa and counterparts are connecting to appliances and fixtures by command to roast my dinner, 6pm for 30 min., at 375° please or draw my personalized bath or shower spray setting, lest we have to feel by trial the perfect water temperature with our own bare hand. Even your toilet can flush itself and Alexa, close the lid please. In another observation from the show: a design aesthetic that has been trying to capture interest for several years has finally not only succeeded; but has busted through in a big way. That is the concept of “thin” surface materials. Completely absent are the 3” high countertops that screamed modern in yesteryear. THIN is IN; thin slabs that is. Whether in porcelain, glass or composite, these thin sheets of material for walls, countertops, or anywhere else you can insert them or laminate them are all the rage. Neolith, an early entrant supplier of porcelain slabs, have perfected their calacatta marble look with opulent book matched slabs. Slabs are available in as thin as 3mm (1/8”) up to the 12mm (1/2”) recommended for counters. Sicis, the maker of awe-inspiring tile mosaics have accomplished the same stunning results with their glass slab product, Vetrite. There is a massive selection; Electric Mable in hot pinks to greys and teals, Gem Glass and abstracts works of art that will leave you gob-smacked. The Gem Glass series looks like you split open a geode, all are simply amazing. Even Wilson Art has jumped in with ThinScape; a composite that can be fabricated with typical wood working tools, will make it a budget friendlier option. Theirs are not the knock your socks works of art but a very good version of stone looks, distressed metal, or wood that stand up to any of the leading quartz engineered stone in the market place. I hope some of my clients will want to use these products. I certainly do! Its a new year and a good time to explore what's hot and what's not while the creative among us are driving and creating new trends in the months ahead. After scouring design editorials there are a few consistent threads. If I may opine....a lot of these trends aren't really new, some are comebacks, some have been on trend for a few years, and some are emerging. 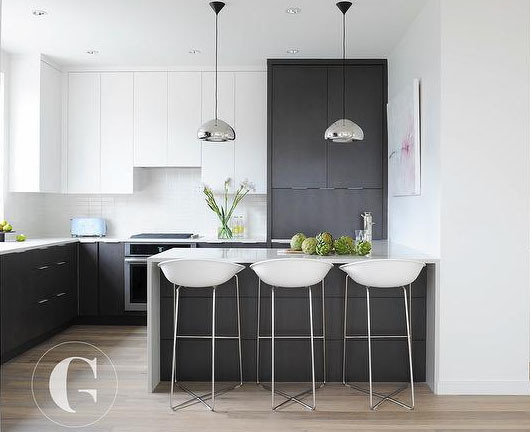 Two Tone Cabinets: The popularity of white & wood is expected to continue or the concept sometimes referred to as "Tuxedo"; containing some version of black and white. This could be grey (or any saturated color) in combination with a pale color or white. Use the contrast in uppers vs. lowers, on an island or just accents. Splurge Spaces: Foyers, powder rooms and laundry rooms. Whether you're impressing your guests or adding function to this space - the foyer is first impression of your home and deserves attention. Ditto powder room, its the room all your guests will likely visit. If functioning rooms like your kitchen and baths warrant good design so goes the laundry room and could make the chore a more pleasurable and efficient experience. Color: Pantone's color of the year, Greenery (15-0343) is a "fresh & zesty burst of yellow-green that evokes the first shades of spring". Its hard to feel anything but happy around this color that pairs well with almost everything. Another color trend: White on White, not literally but white with off-white and creams. This color concept takes an all white room from clinically stark to an inviting space reminiscent of floral blossoms. Glass & Black Iron: Black framed windows, interior doors and shower glass with black grids, we saw a hint of this in 2016, likely inspired by the industrial design trend --predicting this to surge this year. Wood Featured Baths: Expect wood to take a bigger role in bathrooms. Wood soaking tubs, wood paneling, wood floors, wood vanities & storage, wood tub surrounds, wood mats, slats, & benches. Bars: Bars are back! Where once we were ripping out those wet bars from the 70's. Bars are back and big. Perhaps the popularity of mixologist's cocktails or just the need to drink a little more in a time of political uncertainty, entertaining at home is big and a place (big or small) to pour your favorite libation is de rigueur! American Standard, the long well known and reliable middle market brand has been changing things up a bit. Their new 4200 SF design studio located with their research facility in Piscataway, NJ along with an enhanced design team and the addition of DXV, a luxury market division all make it clear they are on a mission to elevate the brand. Displayed at the Kitchen and Bath Industry Show (KBIS), Jan 20, 2016 were the DXV 3D technology bathroom sink faucets. In a most impressive use of 3D printing technology it actually impacts the faucet function by enabling water to pass right through the design. Watch the video!